One unusual feature of traditional Chinese agriculture, almost unbelievable to early visitors from the West, was the Chinese use of human waste as fertilizer for their agriculture. They were “fanatical recyclers”, recovering virtually all waste materials in their society. After an initial cultural shock at the idea, Westerners who heard of the practice would dismiss the concept as medically dangerous and probably resulting in serious chronic disease problems. Yet there is little historical evidence to support that conclusion, and in fact more than 40 centuries of evidence that suggests the practice was successful and sustainable. In light of the many other elegant inventions and methods of living that the Chinese gradually perfected, it is likely that the Chinese system of “night-soil” management was done in a way that largely protected public health. So I am on the hunt for historical details of how the Chinese safely managed their night-soil, and how it affected the health of their population. Research so far suggests that before the 1950s, in traditional China, human waste was routinely stored in ceramic containers. They probably used long storage times to destroy disease pathogens, long enough by today’s science of sanitation, to destroyed or deactivate virtually all human disease pathogens and parasites. The customary length of storage time is not known. In 1911, F. H. King, an American soil scientist, traveled in China to observe how the Chinese could farm the same soil continuously for forty centuries without depleting the soil, while America was severely eroding its soil after only a few generations. One of the most remarkabale agricultural practices adopted by any civilized people is the centuries—long and well nigh universal conservation and utilization of all human waste in China… The storage of such waste in China is largely in stoneware receptacles … which are hard-burned, glazed terracotta urns, having capacities ranging from 500 to 1000 pounds. The Chinese peasants use almost exclusively night-soil for manuring their fields. It is stored in large earthenware pots, either standing free or sunk in the ground up to their edges. In the latter case, privies are built over them. These, open to the public gaze, are not used by women. For the convenience of the latter a wooden bucket with cover is kept in the house, which is emptied into the free-standing earthenware pots out-side the house. In the 1950s, Mao Zedong’s government eliminated private ownership of land, confiscated all personal property, and instituted forced labor for government-managed agriculture. One of the many misguided and disastrous projects was the fertilizer campaign of 1958. Virtually all the night-soil pots in the country were collected, broken into pieces, and put into the soil as fertilizer. After 1958, the family-scale use of night-soil was no longer practiced, as it was impossible without containers. During the same period, Mao’s social policies changed Chinese society from a family-based, small-farm culture to a government-managed collective system. Under the traditional system farmers owned, controlled, used and benefited from recycling their own waste nutrients for food production. They had an incentive to carefully manage and recycle them. Under the new system, no one owned anything personally, and human waste began to be collected at a community scale and assigned to be used on community-managed fields. The work of human waste recovery and recycling thus became one more community job, a low-status job often assigned as a punishment. Rose George published The Big Necessity: The Unmentionable World of Human Waste and Why it Matters. She traveled to China and found places where today’s Chinese farmers put night-soil “in a hole in the ground, covered by mud.” This appears to be a degenerated version of the traditional method of storage in ceramic containers sunken in the ground. To employ again the traditional recycling methods, China needs at least 1.4 billion night-soil containers for its rural residents. Researchers of composting toilets know that pathogens are destroyed by being heated to a certain temperature for a certain amount of time. But little is known about how long pathogens must be contained at room/ambient temperature to destroy/deactivate them all. Two year containment is often estimated to be long enough to be safe. 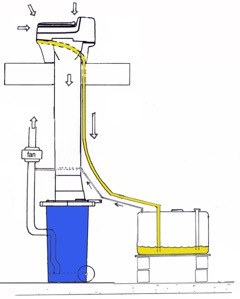 A new user-friendly, urine-diverting, waterless composting eco-toilet was developed and tested in the United States that recovers all nutrients in human waste at a household scale and includes containment of the compost for 2 years. 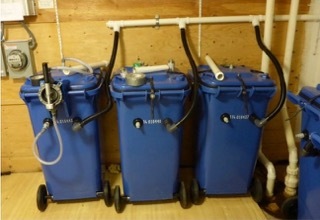 This composting system uses movable bins that are removed when full and exchanged for a new empty bin. The full bins are moistened and attached to aeration lines to compost passively for 2 years. 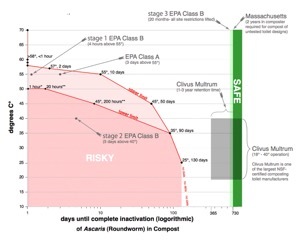 After 2 years the volume of compost is reduced by about 80% and the original pathogens have been destroyed/deactivated. Read the full report.